The Super Bowl is on Feb. 4, but Tirico will be preparing for the Feb. 8 start of the Olympics. NBC will be broadcasting the Super Bowl this coming year, but one of their more prominent personalities won’t be involved. Mike Tirico told Neal Justin of the Minneapolis Star-Tribune that he’ll be missing that Super Bowl, which takes place on February 4, as he’ll be in Pyeongchang, South Korea preparing for his role as the new primetime host of NBC’s coverage of the Winter Olympics, which begin February 8 (with the opening ceremonies on February 9). “The one game that we get every three years, that you can’t wait for, and I will be in Korea,” Tirico said last week. It’s not a long-planned family vacation that will take the sportcaster to Asia. He’ll be the primetime host of the Winter Olympics in South Korea, taking over the Games for long-time staple, Bob Costas. …Tirico admits that he’ll miss not being at the NFL’s biggest game, but he couldn’t pass on the opportunity to quarterback the Winter Games. “As I tell my kids all the time, ‘Life is a series of trade offs,’ and I feel like I won on that trade,” he said. So no truth to my theory that he’s skipping Minneapolis to avoid the cold? What’s not particularly clear is why Tirico needs to make that tradeoff, though. Beyond a few teasers, NBC presumably isn’t starting their Olympic coverage before the first events. In both 2014 and 2016, their coverage started with the first events, and even a primetime special previewing the games aired only the night before the Opening Ceremonies in 2016. So it would conceivably be possible to have Tirico at the Super Bowl, fly him out that night or the following day, and still get him a couple of days of rest and acclimatization before the actual broadcasts start. Significant preparation isn’t ridiculous: the Olympics are such a giant broadcasting endeavor, and will involve new sets and new production people, plus it’s Tirico’s first time as a primetime Olympics host. And being in a time zone so far away will require a few days of acclimatization, to be sure. But it does certainly seem that NBC could have used Tirico at both the Super Bowl and the Olympics if they’d wanted to; this just looks like a decision made to let him focus more on preparing for the Olympic broadcasts and let others handle the Super Bowl. Of course, Tirico has done pre-game Super Bowl stuff before with ABC and ESPN, so it’s not like they’re taking away something he’s never done. He should also get other Super Bowl opportunities in the future. And he’ll likely be calling one before too long; if the current rotation continues, NBC’s next game would be in 2021, and Michaels would be 76 by that point. 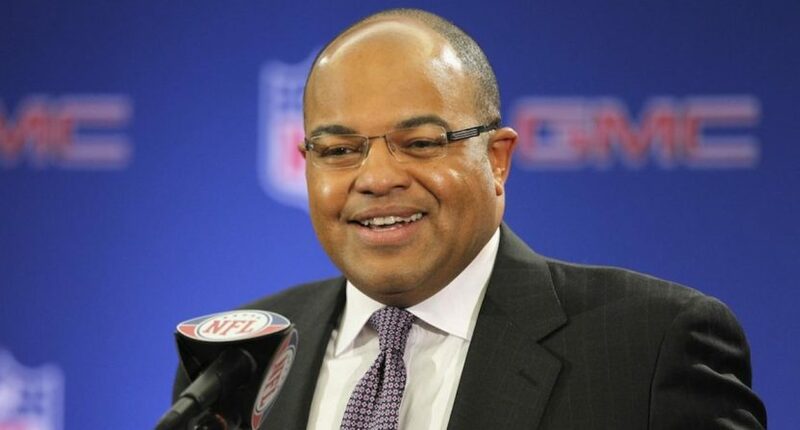 It’s quite possible we get the Michaels to Tirico transition before then. This is a rare situation to have the Winter Olympics and Super Bowl on the same network in the same year. It’s the first time since 1992 (a Super Bowl also played in Minneapolis, oddly enough) that’s happened, and that one actually saw CBS swap spots with NBC in the rotation so they could promote their upcoming Olympic coverage. Those 1992 Games in Albertville, France saw lots of overlap with the Super Bowl broadcast, with Pat O’Brien, Lesley Visser, Jim Gray, Greg Gumbel and others working both broadcasts, but that Super Bowl took place much earlier (January 26, well ahead of the Olympics’ February 8 start). So it didn’t produce the kind of conflicts we’re seeing here. But it did produce significant promotional coverage of the upcoming Olympics, and we’re definitely going to get that during this Super Bowl broadcast too. Just not from Tirico.